Rick Platt: On The Steelers: The Proof I've Been Waiting For! On The Steelers: The Proof I've Been Waiting For! Thanks, Facebook. Facebook produced a report, by county, on where the fans of NFL teams live. I've been waiting for this map for years in my never-ending battle to see more Steelers games on local television in Central Ohio. In their wisdom, the NFL and the television networks have deprived Steelers fans in Central Ohio of Steelers games on a more than regular basis. I've argued that Central Ohio is really Steelers Country and prioritizing putting the Browns and Bengals on air first is not only a bad decision for us fans but also a bad one, economically, for the station and NFL. I've written on this topic before: Jan 2011, May 2011, and August 2012 are three examples. Alas, now I have the proof I've been waiting for all these years. Zoom in on the Facebook-produced map and there it is. 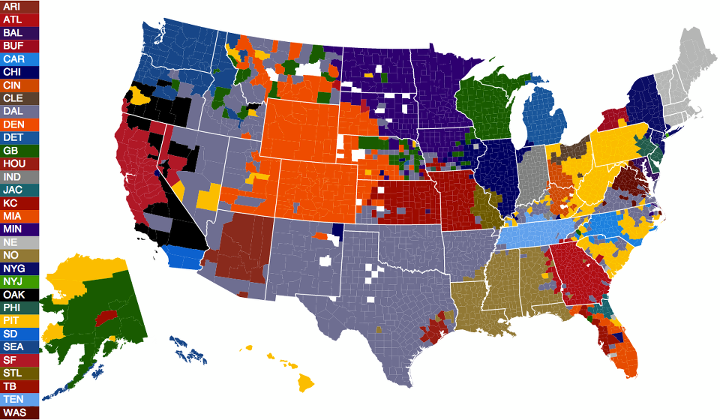 Gold is the counties that favor the Steelers. But for Athens County (an influx of Cleveland area colelge students dominates there), every single county in Central and Southeast Ohio is predominantly Steelers fans. Thus, 10TV in Columbus would be wise to see, and heed, these results. The article is a must read for other reasons too. It also tells us that Browns and Bengals fans count Steelers fans top among their friends' favorites. Interesting that Steelers fans don't reciprocate.